.... it’s not a microwave. It’s a 26-pound robotic personal chef. Other than the bank of lights, which functions as a countdown timer that you can see from across the room, the interesting things about the Tovala are hidden inside. Within the 13-by-20-by-15-inch box, there’s a laser scanner. It’s made for reading bar codes on the lids of compatible meals. You can pop your own food inside the Tovala, but the reason to buy it involves prepared meals, which are packaged and sent to you. There’s a database with cooking instructions for those meals, as well as Wi-Fi connectivity so it can pull down new and newly perfected recipes from the cloud. 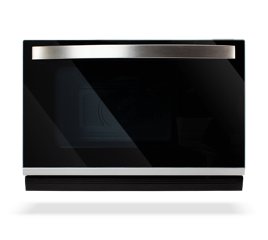 Embedded sensors detect whether the heat and humidity inside the oven is optimal, part of a feedback loop that can make necessary adjustments on the fly. And there’s also a tank of water, which makes the package more than just an expensive toaster oven. It steams, it broils, it bakes, and it convection-cooks—all by itself, based on instructions it follows from each meal’s barcode. Read the entire article.